Earth and Environmental Science Transactions (formerly Transactions of the Royal Society of Edinburgh: Earth Sciences) is a general earth sciences journal publishing a comprehensive selection of substantial peer-reviewed research papers, reviews and short communications of international standard across the broad spectrum of the Earth and its surface environments. The journal prides itself on the quality of its graphics and photographic reproduction. The Editors are keen to encourage interdisciplinary papers and Transactions also publishes occasional special symposia and invited volumes of specific interest. 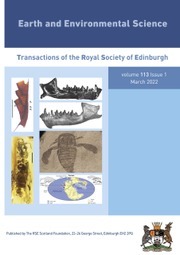 We are currently in the process of digitising the archive of RSE Publications, and the archive of the Transactions, dating back to 1788, will be available from the back issues link on this site. XV.—The Correlation between Relatives on the Supposition of Mendelian Inheritance.